Susan didn’t bite on my proposal. When I tell my older daughters that Susan was, in fact, not interested in my stories, Belén is relieved. She wasn’t keen on being branded as a bucket person anyway. Susanna, on the other hand, is miffed. Hours later she’s still mulling it over and while we trudge through snow, delivering her papers, she comes up with a new plan. I smile at her thoughtfulness and then share what I learned from my friend Kirsten who once attended a Very Important Writing Conference with Very Important People. During a brief appointment with a Very Important Editor, Kirsten learned more about what kind of writing attracts publishing houses. The Very Important Editor told Kirsten it didn’t matter whether her manuscript was the most brilliant, astonishing piece of literature he’d ever held in his hands. What mattered was the size of her following. The Very Important Editor said they were only willing to work with Very Important Writers who had Very Important Audiences. “What’s a Very Important Audience?” Susanna asks. We split ways. She keeps walking on one side of the street and I cross over to the mailboxes on the other. I think about the wise people who had suggested I build a presence on Instagram to interest Canadian Tire in my platform. They were right, of course. Except that I hate Instagramming. For one, my thumbs are too wide. By the time I enter all those crazy hashtags I may as well write an essay on a real keyboard. Instagram, in itself, isn’t bad. It’s a wonderful way to share and connect for many of you, but it’s not the way for me to hustle right now. Even if that’s what it takes to sell my writing to Canadian Tire. The next Sunday we visit my parents and the church I grew up attending. I remember sitting in the pews as a child, staring at old men and the backs of their necks, fascinated by the criss-cross of wrinkles and diamond shapes made by the folds of their skin. Especially if they had brush-cuts. I do the the same this morning, like I did when I was six-years old. Then, when the offering plates are passed I study the ushers walking down the aisles and look around the small sanctuary. Over the years I’ve attended all kinds of churches; some with professional music teams and fog machines, some with liturgies and traditions as awe-inspiring as their ornate ceilings. The church I’m sitting in right now, is neither of these. There’s no hype, no grandeur and no hoopla. And yet, it is one of the most authentic and transformative communities I’ve ever been a part of. I remember how my mom used to worry about its future, wondering “if the church would die” as farm families retire and children look for work in urban areas. It seemed like such an ominous thing and I tried to imagine what a church gasping for its last breaths would look like. But the church never did die. People grew up and left the valley farmland and spruce-covered hills, but others stayed. And still others came. Today the church is full of life. And the growth isn’t just church-y people moving from one congregation to another, it’s because of people who were searching. Who start attending and brought their children. Then their siblings and their siblings’ children. And their parents. I think how David Johnson, the pastor for over 20 years, has been instrumental in this vitality. He’s not loud or flashy, I’m not sure he’s got a Twitter or Instagram account, and his weekly audience hovers around 100, rather than 100 k, but he is a powerful influencer. Not the kind of influencer that would make a Very Important Editor blink an eyelid, but the kind of influencer that changes lives and generations. He’s doing the work he’s called to do and he’s being faithful. People make it to the padded orange-fabric pews on Sunday mornings not because their grandparents did or because they were brought up in church, but because Pastor Dave invites them to look at Jesus. They come because he asks questions instead of forcing answers. They come for the same reason I consulted him, years ago, when I felt caught in the throes of a moral decision. I emailed Dave with the specifics and although I felt silly bothering him with my conundrum I was curious how he would advise me. Always err on the side of grace is the only line I remember from his response. I’ll never forget it. When he hands communion bread to the congregation I see regular people with complicated stories at the table. Not a bunch of parishioners pretending to be religious. This is what influence is like, I think. Hundreds of miles away from any mega church or Important Publisher, this man is making a difference. This is how I want to be faithful. This doesn’t mean I want to become a pastor. (Please God, no!) But it speaks to me on a very practical level; I realize I don’t need to give more time to social media than I already do. I still have creative goals and dreams but I want to remember Dave and his church when it comes to evaluating influence and audience. The next week I will write two poems and submit them different places. I will send off another essay, edit a friend’s manuscript and someone else’s short story. I will play puppy-dog and memory. I will read Maya Angelou, Sally Ito and Lorna Crozier. I will insist on music practice, warm jackets and veggies. I will sprinkle coarse salt on roasted sweet potatoes and put more leaves in our table. Guests will sit on the floor and drink out of measuring cups because there are more people than dishes. I will write this blog. I will walk many miles. This is how I will be faithful, by tending to my audience–the ones already here, including my own body. So dear believers, skeptics and agnostics: find your sanctuary. Find someone who reflects the kind of influence you want to wield. Someone who reminds you of what you’re willing to give up and what you won’t trade for anything. We’re in the middle of a rushed breakfast, and haven’t been talking at all, until Belén interrupts the slurpy silence. Belén holds her cereal spoon in mid-air and looks up to see if I understand the gravity of the situation. I stop brushing Susanna’s hair. “Do you want to take communion at the school?” I wonder if she feels left out when her classmates line up in front of her, tipping their heads back with open mouths to receive the body and the blood. All she gets is a wave of the hand and a blessing. She looks at me in a way that says Come on, Mom. She knows, as well as I do, that any communion she’s had doesn’t count. I know there are many thoughtful and sincere parents who hope to foster a tolerant world view in their children by “letting them choose for themselves”. I wonder, though, if this really works. Is it possible for these little creatures, who seem to crave cut-and-dried answers, to kick back throughout their childhood and wait until they have collected enough evidence to “choose for themselves”? Or do they sponge up all the cues and existential explanations they can get, along the way to their so-called “own decision”? “Mmm… Well I’m not sure what to say, except that I know God is not Catholic. And he’s not Baptist, or Mennonite, or Alliance either, ” I say, listing some of the churches in our town. I go on to talk about how all of this division is distracting and misses the points and makes God sad–when Belén interrupts me with a good bit of common sense. With that comment, the road of logic in my mind makes a hair-pin turn. She’s right. We can’t all fit in the very same church. And maybe this is okay, and doesn’t “make God very sad” after all. As far as I can tell, from bush-whacking through the boreal forest, or a even a handful of pencil crayons, the Creator is absolutely giddy with diversity. 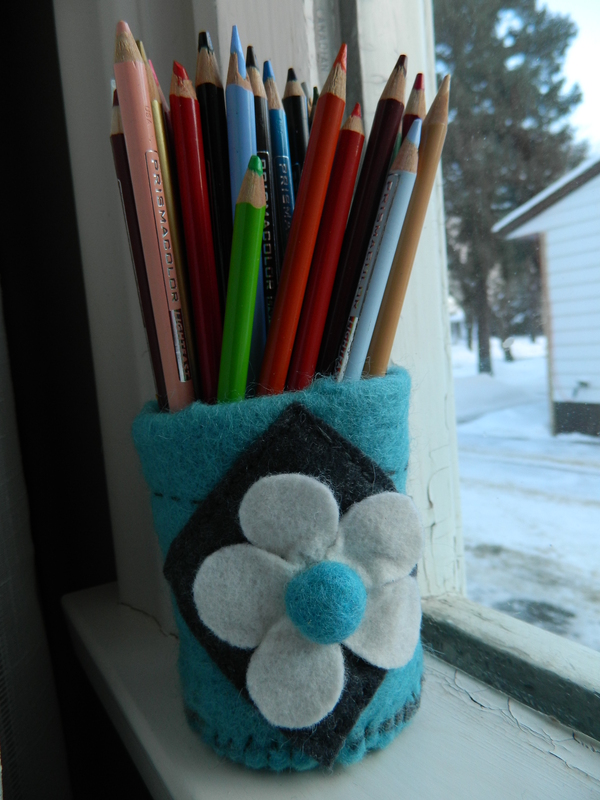 A package, containing these pencil crayons (and holder), arrived in our mail box recently. Thanks Janelle, they go on like butter! Our conversation ends as abruptly as it began and I go back to braiding Susanna’s hair. Perhaps I have an over-inflated mother ego, but I think I’ve got quite a bit of influence on these two little lives and can’t pretend other wise. It appears they have quite a bit of influence on someone else too; their mother. 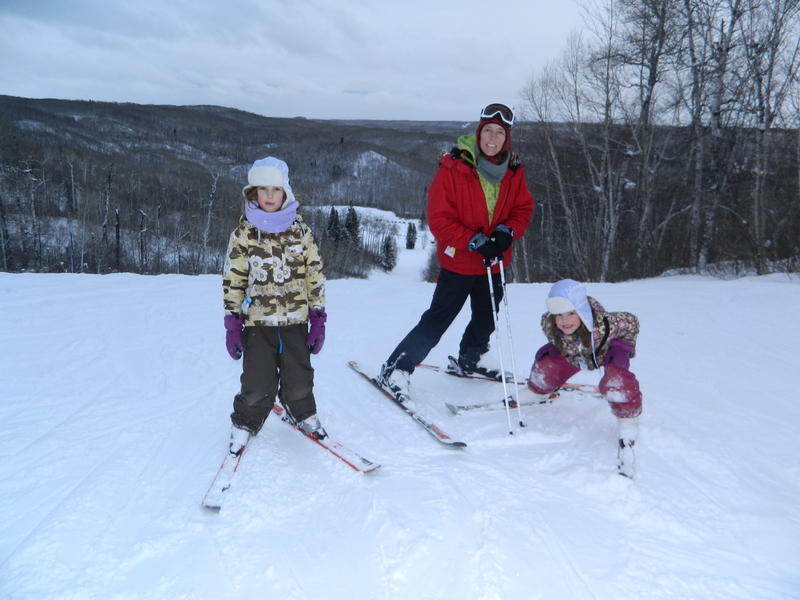 Some January pictures: we went skiing yesterday and LOVED the spike in the temperature. 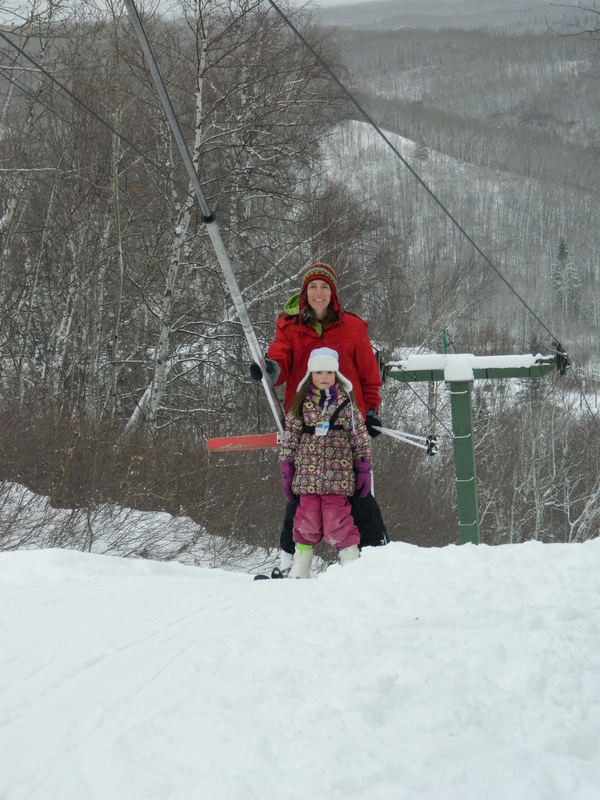 Many of the steeper runs hadn’t been groomed; there was powder up to my knees in spots. I had a feeling it was supposed to be exhilarating, but I felt clumsy and old trying to maneuver my way down… so we kept to the handful of runs that were semi-packed. 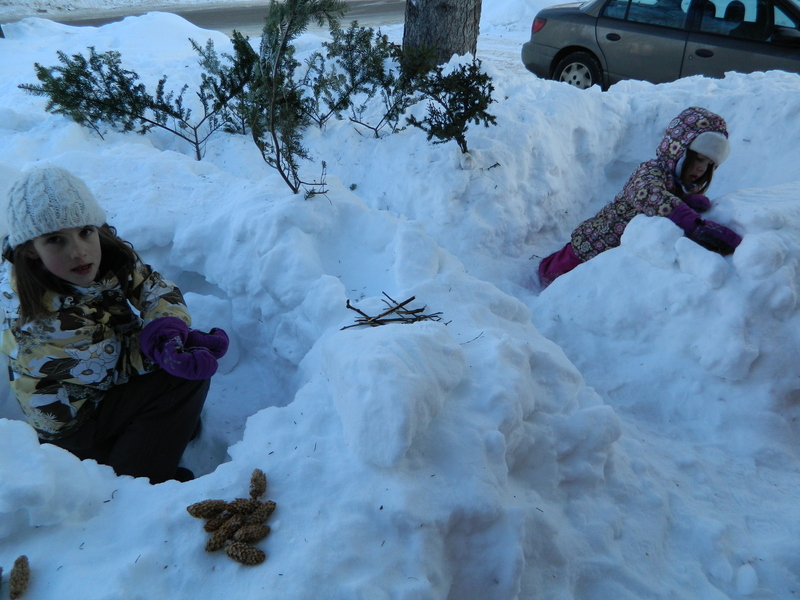 Our front yard is pocked with forts and specialty stores that sell pine cones. Only four more January days left!